Where Am I? – Radiolab. Radiolab is a radio show, similar to This American Life, with many amazing stories. Sometimes they play them on NPR. One of Radiolab’s hosts and producers, Jad Abumrad, recently won a MacArthur Genius Grant! While this whole episode is good, the part that I am really interested in is the story of Ian Waterman, who contracted a rare neurological illness that destroyed his sense of proprioception. Proprioception is the spatial awareness you have of where your body is. Even if your eyes are closed, you can touch your finger to your nose. You can type without looking at your fingers. When you use the stairs, you don’t have to stare at your feet. Unless you are Ian Waterman. After hearing this story I searched for more information. I used to watch so many medical mystery shows and documentaries about people with rare medical disorders when I had cable (yay TLC!). A documentary about Ian’s condition, called The Man Who Lost His Body, aired in 1997. 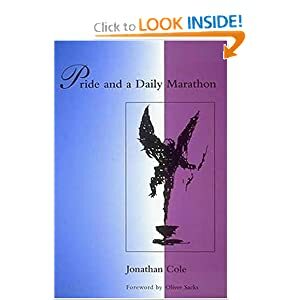 For my birthday I received Pride and a Daily Marathon, a book written by one of Ian’s doctors. The book describes Ian’s everyday struggles and explains how he has re-learned to move.